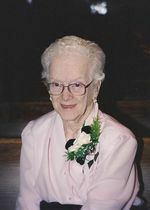 E. Marjorie K. Oblinger, age 96, of Ashland, OH., passed away Sunday, October 05, 2008, at Heartland Home of Ashland. On November 8, 1911, in Galion, OH., Mrs. Oblinger was born to the late Frederick and Fannie (Stone) Kelly. She had been a resident and homemaker in Ashland most of her life. Mrs. Oblinger formerly worked as a dental assistant and then a bookkeeper for Burris & Fasig. She was a member of Ashland First United Methodist Church, Daughters of America, and the Ashland Sr. Citizens. Mrs. Oblinger loved fishing and following the Cleveland Indians. In 1927 Mrs. Oblinger married Percy Frary who preceded her, then in 1958 married Albert Roos who preceded her, and then December 30, 1981 married Richard Oblinger who also precedes her in death. Two sons, Richard Frary and William Frary; 2 sisters, Margaret Lutz and Lois Kelly; 2 brothers, Clifford and Clyde Kelly; and a niece, Pauline Parker all have preceded Mrs. Oblinger in death. Surviving Mrs. Oblinger are 2 daughters-in-law, Betty Cypher of Savannah, OH. and Carol Frary of Floral City, Fl. ; 10 grandchildren; 24 great-grandchildren; 35 great-great-grandchildren; and a niece Dortha Adams of St. Louis, Missouri. Services will be held Wednesday, October 8, 2008, 10:00 am at Heyl Funeral Home, 227 Broad St., Ashland, OH., with Pastor Paul Bennett officiating. Interment will be at Catawba Twp. Cemetery, Catawba Island, OH., at 1:00 pm Wednesday. Friends may visit with the family Tuesday evening 6:00 to 8:00 pm at the funeral home.